The Loudoun County Sheriff’s Office is investigating an armed robbery of the Sun Trust bank branch in the Sterling Plaza Safeway store this afternoon. 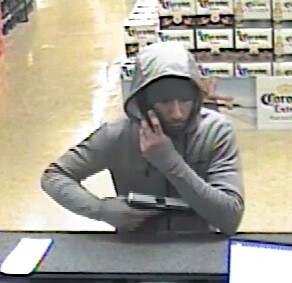 Around 4:40 p.m. Monday, a man approached a teller at the bank and handed the teller a note, demanded cash and displayed a firearm. He left the bank with an undisclosed amount of cash. 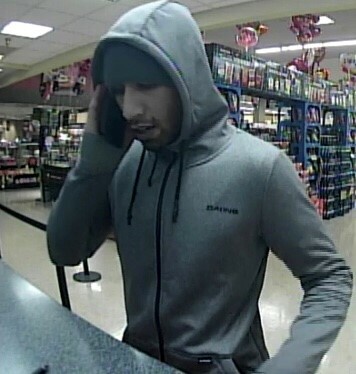 Detectives have released surveillance video stills of the suspect, who is described as a Hispanic or Middle Eastern male, approximately 5-feet, 8-inches tall, with a slim build and stained yellow teeth with chipped front teeth. He was wearing a grey hoodie with the hood up and a knit hat underneath. Anyone with any information regarding the suspect is asked to contact Detective T. Rodriguez at 703-777-1021. You may also submit a tip through the Loudoun County Sheriff’s Office app. I bet being on the phone wasn’t just a cover… I bet he was really on the phone to someone. Unbelievable.